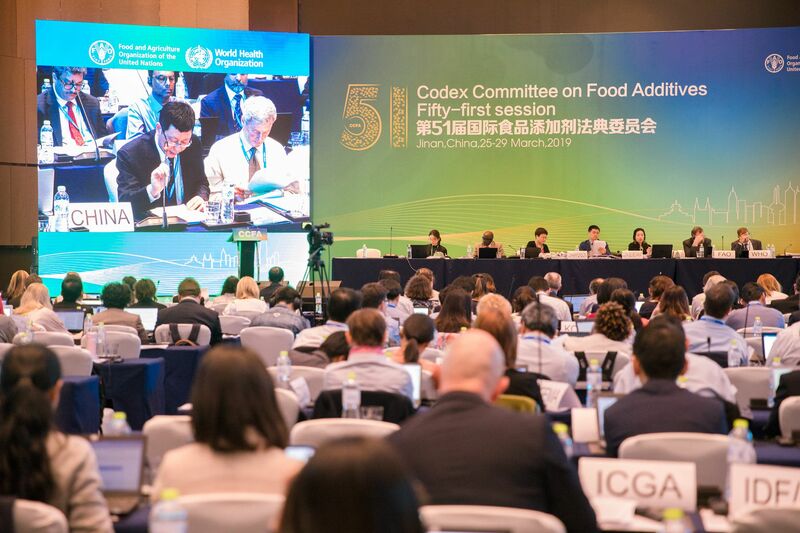 The Codex Committee on Food Additives, gathered for its 51st session in Jinan, China, agreed on 27 March on the priority list of substances for Joint FAO/WHO Expert Committee on Food Additives (JECFA) to evaluate. This list will be forwarded to the Codex Alimentarius Commission, which is expected to endorse. Around 100 substances – flavours, enzymes, sweeteners, thickeners, emulsifiers, colorants and more – which were proposed by Codex Member countries, were put on the priority list. This exercise of developing the new list is carried out every year in a transparent, multi-step process that ensures the engagement of all Codex Members and Observers. Over time evaluations have become more complex. “The vigorous vetting process, including through CAC, ensures that only the substances that are of high importance to Codex Members are added to the JECFA priority list”, said Kim Petersen (right in photo), WHO JECFA Secretariat, adding that over time the list has grown and the evaluations have become more complex. Once approved by CAC, the new priority list will take JECFA multiple years to perform the food safety evaluations. Each year about 25 experts are invited to work independently as scientific experts for JECFA and carry out these safety evaluations. “FAO and WHO are in the fortunate position to attract the world’s top scientists”, said Markus Lipp, FAO JECFA Secretariat. “Without their generous input, it would not be possible to develop the international food safety standards on which so many countries depend to maintain good public health and facilitate the trade of food”, he concluded. JECFA, an international body of experts, was established by FAO and WHO in 1956 and is in continuous operation since that date. Among others, it is responsible for determining whether food additives are safe for human consumption. JECFA is comprised of scientific experts from many scientific disciplines and many parts of the world. The experts are identified through a worldwide public call, which is followed by a careful screening process. In addition to the work of CCFA, JECFA provides scientific advice to other Codex committees, in particular, veterinary drugs (CCRVDF) and contaminants (CCCF). Read more about JECFA on the FAO and WHO websites.